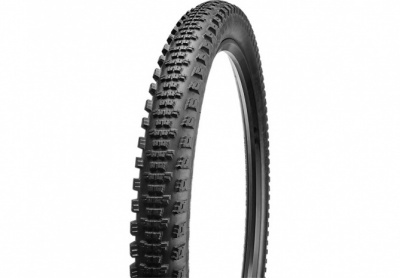 Slaughter GRID 2Bliss Ready / Buy One, Get 2nd Tyre for £10 !! The new Slaughter Grid 2Bliss Ready tyre has been designed for heavy-pedal, hard-pack riding—receiving vertically stepped knob shapes for more knob core stability and additional biting edges. Fast courses on hard-packed ground require a light, fast tyre centre to keep speeds high, but must also keep the speed through loose sandy corners and track well under hard braking. For these reasons, we've kept the high shoulder knobs. Our GRIPTON compound, meanwhile, improves high frequency damping, better attaching the tyre to the ground over small bumps and rough sections alike. This also means that the low frequencies of the rolling tyre deflections pass through unfiltered, leaving no energy to be absorbed and keeping your speed high. Please note hat we recommend GRID tyres for anyone seeking the utmost in flat and sidewall protection or additional stability.